(Ottawa) — The Ottawa Police Service Robbery Unit is investigating a convenience store robbery that occurred on April 7th at 3:32am in the 2600 block of Innes Road. A lone male suspect entered the convenience store, claimed that he was armed, and demanded lottery tickets and cigarettes from the cashier. There were no injuries sustained as a result of the robbery. The suspect is described as black male, 23-27 years of age, 6’0” (183cm) with a large build. 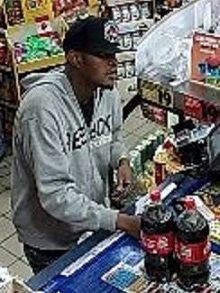 He was wearing a grey Reebok Athletics hooded sweatshirt, blue jeans and a black baseball cap (see picture). Anyone with information about the identity of the male suspect can contact the Ottawa Police Robbery Unit at 613-236-1222 ext. 5116. Anonymous tips can be submitted by calling Crime Stoppers at 1-800-222-8477 (TIPS) or by downloading the Ottawa Police app.